Have you heard the buzz about tiny microgreens aka vegetable confetti? Microgreens are tiny plants that pack a nutritional punch and they are extremely easy to grow. 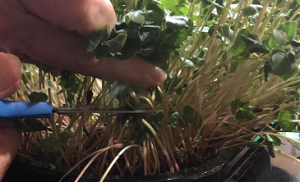 Microgreens is a term used to describe a very young tender crop that is harvested when they are two to three inches tall. The time to harvest is either at the cotyledon stage (seed leaves) or as the first set of true leaves develop. Unlike sprouts, with microgreens you eat the above ground portion – just the stem and leaves. The time from seed to harvest varies with the crop. Some are really fast and can be clipped in 5 to 10 days from planting. Other slower growing crops may take up a month or more before they are ready. To get started, all you need is a 2 to 3 1/2″ deep sterile food-grade container, sterile germination media, microgreen seeds (non-treated), and a misting bottle. There are other options for media such as micro mats, organic burlap and BioStrate felt but plants like beets, cilantro, sunflower and other large seeds prefer a traditional media. Before you plant, do a little research on the crop you intend to grow. Some seeds (beets, cilantro, buckwheat, peas, sunflower, nasturtium, popcorn and winter wheat) should be soaked in water for varying times prior to planting. Another thing to check is should the seed be planted on top of the media or should it be covered. So let’s get growing – it’s time to birth your own microgreens. First, add water to the germination media making sure it’s moist but not sopping wet. Place the media in the container leaving 1/4 inch at the top. Don’t firm the soil – keep it loose. If the seed should be covered, fill the container leaving 1/2 inch of space at the top. Next add seed but forget everything you know about traditional spacing for vegetables! These seed are planted really close. A general recommendation is to plant 10 to 12 small seed per square inch and larger seed 6 to 8 seeds per square inch. Spread the seed over the media and lightly press seed into the soil using your finger tips for those requiring no media covering. For seed requiring media covering, add now. Then using the spray bottle, mist 10 to 12 times to thoroughly moisten the media. Cover the seed with something like an inverted tray to hold in the moisture and block out the light. Most seeds do best at temperatures between 65 to 75 degrees F. Remove the cover and mist twice a day to keep the seeds moist. After most of the seed leaves emerge, place the container on a windowsill where plants will get about 4 hours of sunlight each day. Rotate seedlings every day so they will grow evenly. If you don’t have a good windowsill for growing, try using artificial lights instead. Fluorescent lights are a good option because they don’t generate a lot of heat. Fertilizers are typically not needed because of the quick turn-around time. When seedlings reach the desired height, it’s time to harvest. Once seedlings reach the desired height, about 2 to 3 inches tall, it’s time to harvest. Use a sterile pair of scissors or an electric knife and harvest just above the soil line. The best time to harvest is first thing in the morning or at night when it’s cool and plants are in the shade. Once harvested, gently wash and spin dry with a salad spinner or dry on paper towels. Microgreens can be used immediately or can be stored in the refrigerator for 5 to 6 days. For best keeping quality, store in a lettuce type container that has air holes. One common question is “Will I get more than one harvest?” The easy answer is, it depends on the crop. The initial harvest is always the best but with crops like beets, Swiss chard, and sunflowers, not all the seed germinate at the same rate so you may get a second light harvest. 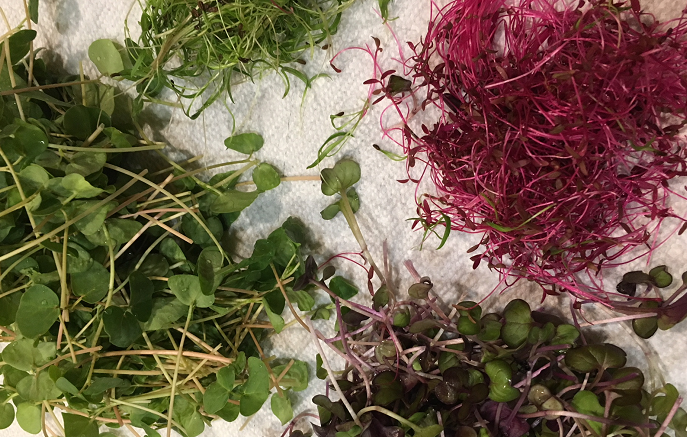 Microgreens are colorful and can be used to add flavor to many dishes. Some are spicy whereas others are mild and sweet. The flavor is more intense than in the mature leaves and you might be amazed that carrot or radish leaves taste like the actual root crop. Add to soups, stews, salads, sandwiches and main dishes. Use them to garnish a dish to give it a special touch. For information on growing tiny microgreens, click here. Horticulture Extension Agent IV Emeritus at UF/IFAS Duval County Extension. Enjoys sharing information with others about Florida Friendly gardening practices.